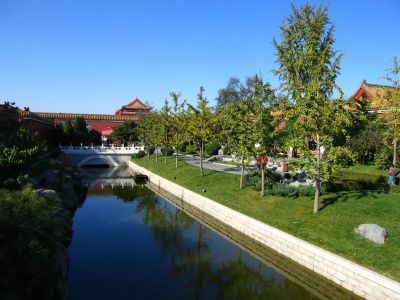 i stayed in a hootang of beijing. hootang translates as "alley" and is the oldest neighborhood in beijing, so there are lots of grimey buildings, grim dark narrow roads, and plenty of characters - if you ever visit beijing a visit to the hootangs is a must. 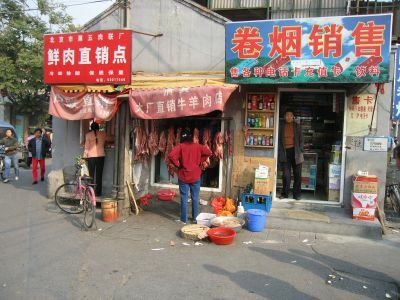 here is a typical store with hanging meat, soft drinks, beer, and customers arriving on bicycles. many chinese cities are heavily polluted and you often see people walking around with masks on to filter the air. perhaps contributing to the poor air quality is the burning of coal for heating and cooking. 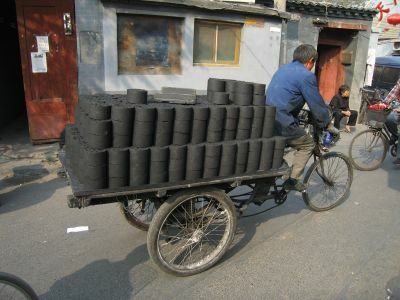 throughout the hootang all day long you encounter men on bicycles delivering coal to the stores and homes. 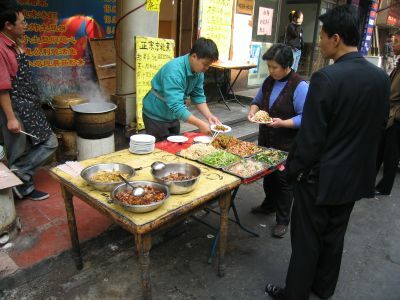 you can eat well for cheap in the hootang - just walk up to a table on the street and point at some ingredients and the chef will happily whip up a killer dish for you. 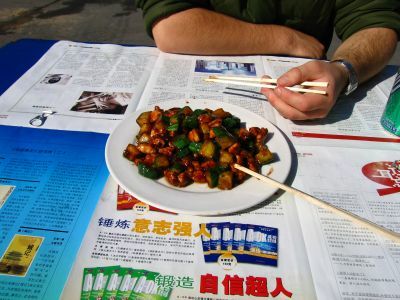 i overcame the large language barrier by bypassing the chinese menu altogether and simply pointing at what i wanted, whether at a table like this or in the kitchen of a restaurant. 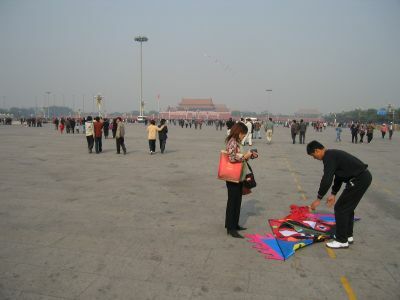 you can fly your own kite in tiananmen square for a small fee. here a woman prepares to do so. chariman mao's mausoleum is behind me and the forbidden city in front. they suggested we do a thousand other things but the only one i accepted was going for a tea-tasting. we drank some phenomenal tea here including some made with flowers which tasted fruity. 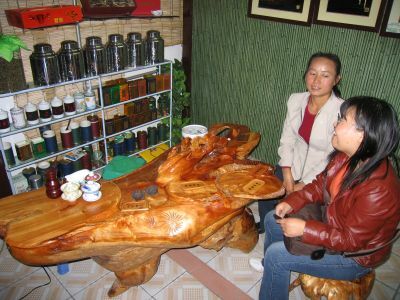 a woman sat behind this log table and brewed it up and then poured out small cups. after about a thousand glasses the bill arrived, and i sat on my hands. i was sitting this one out. the girls turned to me for my share but i didn't budge. it cost them 120 yuan which perfectly offset the lunch. one for you, one for me. i didn't stick around with them after this to see if i could break the tie. not really sure if they legitimately wanted to hang with me and practice english or if they just saw me as a way to finance an afternoon of fun. it's a frustrating thing about traveling sometimes - you automatically mistrust everyone until they "prove" themselves. it would be great to meet locals but the fact is they often just want to victimize travelers. oh well, i had fun and bought a couple local girls a lunch - not so bad even if it was a scam. 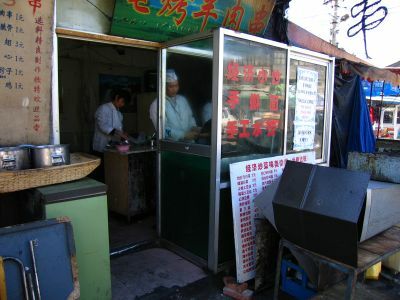 if this hootang restaurant was in the u.s., or any other 1st world nation, you would not be able to eat here because it would be boarded up by the national health agency. on one cold night i was eating inside and had to move my feet so the chef could retrieve some potatoes that floated in a bucket under our table - their hygenic habits were best ignored. but i ate here 9 times anyway; the atmosphere and food was amazing. every time i ate at my favorite restaurant this kid took our order. morning, afternoon, night - he was ALWAYS there. he spoke a small amount of english and was extremely friendly - i was happy to give him business. 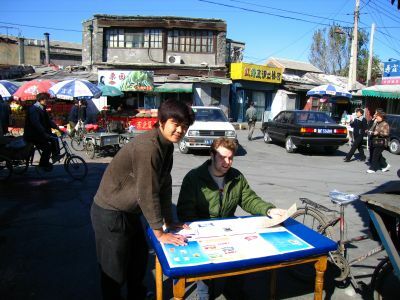 whenever he'd see me walking up the street, he'd retrieve a folding table, set it up in the street for me, cover it with newspapers, pull up the required number of stools, drop a menu down, and then stand there for an immediate order. here he is taking ben's order. here is the chicken and brown sauce, it cost $1.50. oh baby, i can taste it just by looking at this picture!